We know, based on multiple independent studies, that ENVIRO - BOND polymers are the highest quality products of their kind available in the world today. We strictly adhere to the principle that quality is never an accident. ENVIRO - BOND products reflect years of research and skillful development designed to exceed present day standards. Other spill products do not possess the innovative technology of ENVIRO - BOND and are truly not well designed, developed or researched, simply well marketed. When evaluating ENVIRO - BOND on a price basis, it is important to remember that any other product on the market that even comes close to offering the overall benefits and effectiveness of ENVIRO - BOND will require at least four (4) or more times the amount of material to effectively encapsulate and solidify the same quantity of spilled hydrocarbon. Since you will need to use much less ENVIRO - BOND, you will need to buy, handle and store much less sorbent product than with other products. As the amount of waste generated is significantly reduced, you will also haul, handle and dispose of much less waste mass than before. These factors combined with quick, effective and complete spill control/cleanup and tremendous labor reductions make ENVIRO - BOND an extremely cost effective cleanup product. In addition to those benefits already discussed, ENVIRO - BOND polymers possess the unique ability to surpress the vapors of the encapsulated hydrocarbons. Furthermore, most products on the market will leach the product that they have absorbed back into the earth, ENVIRO - BOND will never release the encapsulated hydrocarbons. It is also important to emphasize that ENVIRO - BOND 403 is hydrocarbon specific, i.e. it will only absorb and molecularly bond with the spilled hydrocarbon while repelling any water. Any uncontaminated polymer can be recaptured and reused, adding further to the cost benefits of the product. We hope you will consider ENVIRO - BOND polymers for your remediation needs. The 400 series polymers have the ability to bond with diesel fuel, gasoline, waste oils and most other liquid hydrocarbons to form a solid mass. This is accomplished by an actual molecular bonding, not just a "physical" soaking or sponging, of the liquid hydrocarbon. With the encapsulation process beginning immediately upon contact between the liquid hydrocarbon and the polymer. This bonding and solidifying can be accomplished on any surface and a solid and manageable waste product, that will not drip when handled, is typically formed within 10 - 15 minutes after application or sooner. The application ratios being as high as 1:15 by weight, depending on the type of hydrocarbon being encapsulated. Clean up is fast, effective and cost efficient and, with less material to buy, store, handle and haul, yielding significant reductions in waste mass generated, the result is a significant reductionof disposal costs. The ENVIRO - BOND polymers have the "unique" ability to suppress vapors and reduce off-gassing by 80% within the first 5 minutes. The gases/vapors are trapped within the solidified structure and are prevented from migrating to the surface area, yielding almost total elimination of any vapor release over the course of several hours or days depending upon the hydrocarbon that has been solidified. As a result of this vapor suppressive ability, spontaneous combustion and unintentional spontaneous ignition hazards are almost totally eliminated. On the surface of water, the polymers, are completely hydrophobic and will float even after maximum encapsulation and solidification. 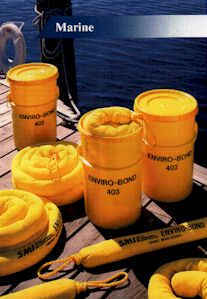 They will not water wet even in very severe conditions and any unused polymer can be captured and reused. On any surface, including water, the polymers will only bond with the free hydrocarbon molecules. Solidifying hydrocarbons into a solid mass on water makes for a much easier surface area cleanup while removing even the most subtle slick or sheen. The polymers packaged in booms and pads make for extremely easy and effective cleanup on water, they are easy to retrieve and will remain floating indefinitely. Harmless to fish and wildlife. The polymers can be mixed into soil surfaces where spills frequently occur and left unattended will perform their encapsulation, stabilization and solidification duties as a spill occurs. The bonded hydrocarbon will never leach from the solidified mass and is very easy to handle, store or dispose of. The polymers have an indefinite shelf life. The polymers are FDA Food Grade and are non-toxic, non-corrosive and non-carcinogenic. No exotic protection needed (goggles & masks suggested), creating safer working conditions, lower exposure risks and reduced liabilities. The polymers are formulated to react with all organic hydrocarbons, but, are not recommended for use with "synthetic" hydrocarbons when solidification is the desired end result. The polymer will perform without mixing, and under most conditions simple surface application will be adequate, however, with very thick layers of hydrocarbon, some mixing may be desired for quick and complete solidification. The polymers will not dissolve in the presence of high or low pH solutions containing water. The polymers will break oil and water emulsions by bonding with the non-dissolved portion of the hydrocarbon molecule and leaving the water free. The polymers have the ability to bond and virtually not release heavy metals that may be in solution with the hydrocarbon. The polymers can act as a pre-scrubber to carbon filtration by removing the non-dissolved portion of the hydrocarbons before final filtration. If the liquid media containing PCB's is of a hydrocarbon source, the polymers have the ability to encapsulate and solidify the entire mass yielding extremely manageable disposal of a solid form. The polymers have been found to be extremely effective in the treatment of very hazardous waste by forming a solid mass that is very safe to transport and dispose of. Typical disposal methods are landfilling or incineration of the waste, consistent with local, applicable regulations. As a landfilled waste, the non-biodegradable polymer will never leach or release any of the encapsulated and solidified waste liquid/s. Reducing or eliminating your liabilities. The polymer when incinerated produces virtually no ash residue and has a BTU value of 18,602. Meets established EPA landfill requirements. We know, based on multiple independent studies, that ENVIRO - BOND polymers far exceed the physical properties and capabilities of the conventional products such as cellulose, spun poly- propylene, ethylene, saw dust, peat-moss, ground foams, clay based absorbents and other such products. The ENVIRO - BOND 300 Series of Aqueous Solution polymers encapsulate aqueous solutions such as water, acids, caustics, bases, bodily fluids and water soluble hydrocarbons such as engine coolant (glycol) and methanol. Encapsulation, stabilization, immobilization and solidification begin immediately upon contact between the polymer and the aqueous solution - fast acting and safe. Little or no mixing is required - simple application of the polymer to the surface of the spill is usually adequate with the polymers having a typical absorption rate of up to 300 times their own weight in neutral water. ENVIRO - BOND polymers have the ability to solidify and stabilize hazardous liquids, with very small amounts of polymer and render them effectively and cost efficiently safe for disposal. The polymers will absorb heavy metals and other dissolved solids that may be in liquid. The polymers have an indefinite shelf life and have a microbiological half life in excess of 400 years. The polymers will not absorb any free hydrocarbons, but, will absorb virtually all hydrocarbons that are dissolved in a water phase. The polymers are heavier than water and will sink to absorb from the bottom up. While not soluble in any solution, the polymers will absorb any solution containing water. The absorbed liquid/s will not release as a liquid, but, will only release the water portion of the absorbed liquid at various rates of evaporation based upon ambient temperature and humidity. This reduction of generated mass through evaporation yields a tremendous reduction in the amount of waste to be disposed of, resulting in a significant reduction of disposal costs. The polymers are extremely effective in mixing with all types of sludge's for the stabilization of liquids contained within the sludge. The aqueous polymers will not coat out or become ineffective in the presence of hydrocarbons and will break oil and water emulsions by absorbing the water phase and leaving the hydrocarbons free. ENVIRO - BOND 300 Series polymers are available in both Anionic and Cationic formulations, each having a different capacity for absorption of either acids or base liquids. The Anionic is recommended for use with high pH solutions and the Cationic is recommended for use with low pH solutions, however, either the A or C 300 polymers will work effectively with either high or low pH solutions if immediate time constraints are not a consideration. The Cationic polymers will absorb concentrated acids without any violent heat of reaction and with only a small amount of off-gassing. This renders the mass stable from ion exchange and safe for handling. The same is true of the Anionic polymers with base liquids. Polymer particle sizes can be provided in either coarse grain for large spills or fine grain for small spills with a particle range from 0.5mm to 1mm being the standard shipment size. Liquid capacity of the 300 polymers is based on fresh water loading and ratios may vary based on waste product chemistry. Forms a permanent bond with diesel fuel, gasoline, waste oil and most other liquid hydrocarbons - A chemical reaction/molecular bonding, not just physical "sponging"
Remains buoyant after encapsulation for simplified waste recovery. Reduces clean-up time and cost. Captures only liquid hydrocarbons. Lets water pass, adding to the selectivity; won't absorb water. Works on hard surfaces or water, fresh or salt. Is easy to handle, to disperse and recover. No exotic protection needed (only goggles & dustmask suggested). Safer working conditions; reduced liability. Less needed to buy, haul, handle and store. Need less/cost less. Since less needed, less waste is generated. Clean up and disposal costs minimized. Can't be pressed or squeezed out. Will not drip when handled. Reduces exposure to hazardous materials, thus safer. Cleanup and disposal costs minimized. Floats, is easy to handle, to disperse and recover. Reduces if not ends, liability. Reduces and contains contamination. Reduces liability. *NOTICE: Due to a wide range of liquids that ENVIRO - BOND 403 can absorb, Lakefront Enterprises cannot recommend specific disposal methods. Used ENVIRO - BOND products must be disposed of in accordance with local, state and federal regulations. Please refer to the material safety data sheet on this product for additional information. Q. WHAT IS 80% REDUCTION IN FLAMMABILITY? A. Flammability is directly related to off-gassing. The off-gassing is reduced with fraction of the fuel is being trapped within the polymer structure. The flash point remains the same with a much slower burn rate because the aromatic fraction is released. Q. WHAT IS THE FLASHPOINT OF 403 AFTER ENCAPSULATION? A. That is totally dependent on what it has stabilized. The flashpoint is not changed. It will remain the same as the fuel source. Q. WHAT IS THE RATE OF BURN OF RAW 403? A. That has not been determined. However, it is very difficult to ignite. It will burn. Refer to the M.S.D.S. for fumes emissions. Q. WHAT IS THE BTU VALUE OF 403? A. The BTU value is 18,602. Q. WHAT IS THE ASH CONTENT OF 403? A. Laboratory tests show no ash. Q. WHAT LIQUIDS CAN 403 ENCAPSULATE? A. This polymer is designed to molecularly bond the liquid organic hydrocarbons or a paraphenic and napthenic matrix. This will not work on water soluble hydrocarbons such as acetone, naphtha, glycols, etc. Q. WHAT EFFECTS DO TEMPERATURE CHANGES HAVE ON THE BONDING TIMES AND CAPACITY OF 403? A. It is slowed with lower temperature because of the immobility of the material structure of the hydrocarbons. Water Spills: The salinity of water will not affect the polymer performance. It will work on both fresh and saltwater. Large Spills: Where very large spills exist, and a large volume of ENVIRO- BOND 403 is to be deployed, it can be best dispersed through a Venturi hopper and water (a carrier fluid) to reduce static charge. It may also be dropped from the air, pre-wetted using a C02 timed detonation device. ENVIRO - BOND 403 mixed with water will not clog pumping devices and the polymer will not water wet. Small Spills On Any Surface: May be applied directly to spill. Special Uses: Soils may be pre-treated with ENVIRO - BOND 403 where spills occur. The spilled hydrocarbons will bond with the polymer to form a solid and reduce further groundwater contamination. This will provide for a very manageable solid with reduced volume and mass. Spill Treatment: The perimeter of a spill should be treated initially to form a boom, then the inside area treated to stabilize the liquid hydrocarbons. Booms, pads, and pillows are available. Filtration Effectiveness: ENVIRO - BOND 403 will act as a preliminary absorbent for cleaning water contaminated with non-water soluble hydrocarbons. This would work in conjuction with activated carbon for fresh water purification. Carbon is a well known product for extracting solubilized hydrocarbons in water and is known to bind to raw hydrocarbons, rendering it ineffective. The polymer reacts with the liquid hydrocarbons which makes the carbon more effective. Recovered Stabilized Masses: All stabilized hydrocarbons can be reclaimed as a fuel, source liquid, or solid. The BTU value of the fuel is captured and can be used in co-generation. Remediation of Land and Ocean Water Spills: The entire area should be cleaned and disposed of in accordance with federal, state and local regulations. Open water may be remediated by a fine mesh fishing net to collect the bonded mass. Dispose in accordance with federal, state and local regulations or tendered as a fuel. Mixing with Liquid Hydrocarbons: Mixing is not necessary. The polymer will absorb and bond with liquid hydrocarbons in turbulent flow such as a rapid moving stream, river, or wave action. The polymer will break a water/oil emulsion. The amount of ENVIRO - BOND 403 will vary depending on the type and viscosity of the liquid hydrocarbons to be stabilized. The age of hydrocarbon may range from months to years, depending on its volatilization. Concentration: The amount required will usually be between 10% to 25% by weight with the addition of ENVIRO - BOND 403 to the liquid being stabilized, and will reduce its toxicity. Bonding begins immediately and continues for about 30 days. ENVIRO - BOND 403 is not affected by water salinity. ENVIRO - BOND 403 is effective in any temperature range between -10° F to 100° F as long as the hydrocarbon is a liquid. Colder temperatures will require more time for bonding to occur. Windy conditions on water: The leading edge of the spill should be treated with follow up being treated up-wind of the body of the spill. Not applicable to EPA guidelines-requirements. A recent comparison between ENVIRO - BOND 403 and another nationally known brand was made. FACTS: A 75 gallon spill. 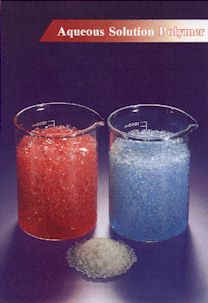 The absorbent ratios and the amount of product in each boom (sock) for each brand was factored. RESULTS: To effectively encapsulate and solidify the 75 gallons, only eight (8) 3" X 10' ENVIRO - BOND booms were used. To sponge up the same 75 gallons, forty one (41) of the competitors 3" X 10' socks were needed. ENVIRO - BOND : Generates less than 1/2 cubic yard. To test ENVIRO - BOND 403's encapsulating ability, fill a cup 3/4 full of water. Float approximately 1/8" to 1/4" layer of Marvel Mystery Oil ( or any other available liquid organic hydrocarbon on top. Sprinkle just enough ENVIRO - BOND 403 on top of the "oil spill" so that the top particles remain white. ENVIRO - BOND  403 starts encapsulating immediately upon contact with the hydrocarbon. In about five minutes, you will be able to remove the solidified "spill". There is no residue on the water/oil interface. Pat the encapsulated oil between some paper towels to dry any excess water. Pick up the solidified mass in your hand and squeeze... hard. You cannot press out the stabilized fuel oil. You would not want to try this with other absorbents.. Hazardous Components (specific chemical identity: common Name) Based upon data available, this product is not hazardous under OSHA hazard communications. Special Fire Fighting : Cool exposed containers, Avoid exposure to products of thermal decomposition, wear positive pressure breathing apparatus and bunker gear. Material will not burn unless preheated. Hazardous Decomposition Products : Co, Co-2 may produce Acrolein, acids, ketones aldehydes. Treat combustion products as toxic. Health Hazards (acute & chronic) : Available data and experience show potential for slight irritation to eyes. Slight oral toxicity. Medical Conditions generally : Preexisting eye, skin and respiratory disorders aggravated by exposure may be aggravated by product. Emergency & First Aid Procedures : Eye Contact - Flush eyes with water if irritation occurs, consult a physician. Burns - Treat as for ordinary burns. Waste Disposal Method : Follow federal, state and local regulations. When used as an absorbent, follow regulations for absorbed material. Precautions to be taken in Handling : Product can accumulate static charges when and Storing handled. Avoid clouding dust conditions. Other Precautions : Avoid breathing vapors from heated product. Respiratory Protection : Normally not required. Use NIOSHA approved SCBA if product is heated or involved in a fire. : Eye protection - Safety glasses or goggles. Other Protective Clothing : None required. While the information herein is believed to be reliable, no guarantee is made as to its accuracy of completeness. The condition of use, handling, storage and disposal and the suitability of the product for particular uses are beyond our control. Consequently, all risks involving the use of the product are assumed by the user. We expressly disclaim all warranties of every kind and nature, expressed or implied, including the warranties of merchantability and fitness for a particular purpose. With the emerging environmental issues picking up steam in the 80's and the panic pursuit to come up with waste management programs to meet the unfolding regulations, the direction was clear. Achieve the highest level of stabilization with the least amount of ad mixture and do it cost effectively. The research began in early 1986 after reviewing many methods that were being employed and not seeming to solve the problems. Everything was winding up in landfills unstabilized with huge volumes being generated. Landfills were filling up and developing problems, while increasing the liability to the generator. Absorbent products were coming on market at a rapid rate (such as sawdust modified clays, spun fabric, corncobs, peat moss, etc.) These products allow a generator to remediate one area but created a landfill problem. Even though a federal directive land-banned these, they are still used widely, disguised as sanitary garbage and landfilled. Many companies have tried stabilizing land-banned waste without the ultimate success, and which has only increased the principal polluted masses in volume by 300 - 400 %. The solution to pollution is no longer dilution but is finding the answer. During the time from 1986 to 1990, we had researched three different polymer structures with moderate results. During that period of time, our main focus research was done on drilling fluids and aqueous stabilization. In the summer of 1990, an intensive research was launched. It was discovered that the polymers reacted differently with different hydrocarbons and with different timeframes. Since the hydrocarbons source would consist of three basic components - Parafinics, naptinics, aromatics and fractions thereof, the fractions of hydrocarbons may be water soluble and non-water soluble. The water Soluble hydrocarbon structures will require a polymer structure very different from that which will bond and stabilize non-water solubles. These polymer structures for the water solubles will be discussed in a separate communication. The principal polymers of this discussion will be those that bond and stabilize non-water soluble hydrocarbons (crude oil, diesel and gasoline). After the testing of many polymer structures and determining the results, we then filed for patent covering the methods of stabilization of hydrocarbons. WHAT IS A POLYMER ? A polymer is the bonding together of molecular structures of various molecular wts. or substances having the same molecular wt. to achieve the molecular wt. and structure for a useful function and purpose. The society that we know today would not exist without polymers. Products such as Saran Wrap, Tupperware, plastics used on telephones, computers, etc. are polymers. Polymers are substances that may consist of large macromolecules, are made up of repeating units. The molecular sub-units that are used to synthesize polymers are called monomers and reactions by which monomers are joined together is called polymerization. Before we could market the polymers for spill response, we decided to have one formulation tested under E.P.A. guideline 40 CFR 300, subpart J of the national spill contingency plan. A trade name for the product has been registered and identified as ENVIRO - BOND. The hydrocarbon stabilizing polymer will be identified by 400 series. The test results are supplied as a part of this paper; however only the results will be discussed. The tests were done covering two species and heavy metals. In 1990 an agreement was reached with the New Mexico State University for a research project using polymer. The research was done under the direction of Dr. Hernandez, who was a former deputy director of EPA and is currently Professor of Civil Engineering. The study was done under a grant from the Department of Energy. A master's thesis was generated as result of that study. The entire master's thesis is not a part of this paper, however, some of the results are. The focus of the study was directed to under ground storage tanks (UST's - please see page #21 for Off-Gas Test comments). Three test results are part of this paper. This polymer technology is now a part of a study at the University of Texas and Southwestern Texas University which is being funded by the Advanced Technology Program of Texas. Research is also continuing at the New Mexico State University and Millsaps College Sorbent Lab. It has been submitted to Texas A & M, and to Corpus Christi State University for further tests. This research includes studies of the half-life of the polymer and soil mixture capabilities for best barrier resistant material. The polymer structures formulated and tested are of the highest quality and consequently the most expensive. Reference the Valdez: the amount of polymer required to stabilized the entire loss would have cost only $300,000,000.00. The entire mass would have been converted to a solid. The shore lines would not have been contaminated and the mass would have been retrieved in solid form, safely stored and made available to a fuels program. It is estimated that more hydrocarbons were spilled on the ground in Michigan and Ohio in 1991 than was lost in the Valdez spill. Michigan is unique in that it is surrounded with 25% of the world's fresh water supply and 95% of the entire United States supply. We have a responsibility to protect all fresh water supplies, even where it is not so abundant. Selecting the polymer structure plays a major role in protecting the environment from spilled or leaked hydrocarbons. In our research, we determined the effective polymer structures in addressing three common hydrocarbons, crude oil, diesel fuel and gasoline. Our research polymers consist of some 31 different structures with 12 different backbone structures. The polymer formulation had to produce bonding immediately, with 100% in five minutes. The polymer is hydrophobic; will float on water and will not water wet. The polymer density is great enough to sink through the hydrocarbon that is on water. The polymer mixed with soil would allow water to pass through while bonding the hydrocarbon. The polymer would not require mixing but only utilize an applying technique. The polymerized masses that have been stabilized are remediated and stored and are now being considered for a liquids fuel program that will be introduced in the next few months. After a year of research with a major company, the polymer can also be used in treating oily sludges, bonding the hydrocarbons, entrapping the solids, and releasing the water. This would eliminate trying to break emulsions and filter pressing. This has been done successfully and the BTU values established. These masses would then be transported to a liquefier system to be made into a liquid fuel source, or be ground up for a solid fuel. The result is no landfill or liability. It is believed that the TCLP and TPH test may well dictate landfills on just what they will be able to accept. While it is not our policy to recommend disposal, nonetheless, the polymers represent the best stabilization or immobilization of liquid hydrocarbons, with the least amount of ad mixture. This research began to be introduced into the oil and gas industry, so it would have responsible products at it's disposal and to provide effective products to clean up accidental spills, leaks and drips. These products are now finding their way into many other market segments: Industrial, Commercial, Shipping, Boating, Airports, Fuel Centers and Trucking. These products have already begun replacing the absorbents, clays, saw dust, peat moss and other mixtures. We fully endorse other responsive research that is beneficial to the protection and enhancement of the environment. We do not believe that any one company has all the answers. The off-gas testing phase of this project went well. The results of the BTEX off-gas analysis are presented in Figures 4.14-4.17 of the formal New Mexico State Study. These figures show rates of BTEX off-gassing as nanograms per microliter per hour (ng/(\/hour) versus time. Time is expressed as the age of a gelled sample, at the time of its sampling, in days. The overall trend of the data indicates a continual decline, and/or a leveling off, in the rates of BTEX off-gassing from individual polymer-diesel fuel gelled masses. Again the concept of an improved gelled mass condition occurring with time has been demonstrated. While the owners of USTs have discretion over choosing to close and remove or just to close a UST which is no longer suitable for service, a UST must be cleaned inside prior to either option. In order to clean the inside of a tank, a person is usually required to enter the tank. Accumulated gases within a UST could be reduced prior to human entry with the use of gelling agents and adequate ventilation. Currently the cleaning of USTs is done in several ways. Steam and detergent cleaning is one method. This process produces contaminated water which must be treated to remove hydrocarbon contaminants. If the sludges within USTs were gelled with polymers, the internal tank cleanup may be less of a problem. Gelled materials could be scraped up or shoveled out of the UST. Off- gasses in the restricted environment would be reduced, providing a better work environment which could have a positive effect on project liability costs. Q. WHAT IS THE 1/2 LIFE OF ENVIRO-BOND 300? Q. WHAT LIQUIDS CAN 300 ENCAPSULATE? A. Virtually all aqueous liquids which would include water soluble hydrocarbons, acids, caustics, anti-freeze (glycol), methanol, bodily fluids, etc. It will have a slower reaction with saltwater and a much lower absorption capacity. Any solution that contains electrolytes will affect the absorption rate and capacity. Q. WHAT EFFECTS DO TEMPERATURE CHANGES HAVE ON THE BONDING RATES OF 300? A. Relatively none. It is a little slower in colder liquids and faster in hot solutions. ENVIRO - BOND 300 Encapsulates aqueous solutions, liquids such as water, acids, caustics, bases, bodily fluids and water soluble hydrocarbons such as engine coolant (glycol) and methanol. ENVIRO - BOND 300 is easy to apply. Just sprinkle onto the spill or pour into the mass of liquid. It starts working immediately and depending on the liquid that you are absorbing and the temperature of that liquid, it works in just a few minutes. Not only is ENVIRO - BOND 300 quick, it is cost effective, not only because of the variety of the products it absorbs, but because of it's high absorbency rates, 300 to 1 ratio by weight of deionized water in laboratory testing - a rate much higher than many other absorbents on the market. ENVIRO - BOND 300 comes in the form of small, clear, dry crystals and is available in two grinds: fine for spills and accidents, and coarse for stabilizing large masses of liquids such as 55 gallon drums, etc. FOLLOW THESE DIRECTIONS TO DEMONSTRATE YOUR OWN "SPILL"
Pour 8 oz. water into a small pan. Broadcast between one and two teaspoons of the ENVIRO - BOND 300 "F" over the surface of the water. In less than a minute, the entire "spill" will be solidified. This grind is especially effective on a smaller spill situation. Fill an 8 oz. glass approximately 3/4 full with water. Pour approximately one teaspoon of the ENVIRO - BOND 300 "C" into the glass of water. After six to seven minutes, the entire glass of water will be solidified. The coarser grind should be used to solidify a mass or volume of contained liquid and is especially effective on large volume spills. Nature of Hazard : This product had been determined to be non-hazardous in accordance with 29CFR 1910.1200. However, as with any chemical, this product should be handled with good industrial hygiene, and safety practices as set forth in this material safety data sheet. Ingestion : If ingested, give emetic and seek medical advice. Stability : This product is stable and will not react violently with water. Hazardous polymerization will not occur. Physical Properties : Density is 0.8 g/cc. Eye Protection : Use splash goggles or face shield when eye contact may occur. Skin Protection : Use gloves, if needed, to avoid prolonged or repeated skin contact. Respiratory Protection : Normally not needed, but use dust mask if needed to prevent inhalation of airborne particles. Ventilation : Provide adequate ventilation to minimize dust inhalation. Minimize Breathing Dust : Avoid prolonged or repeated breathing of dust and contact with skin. Remove contaminated clothing, launder or dry- clean before reuse. Cleanse skin thoroughly after contact, before breaks, and meals, and at end of work period. Product is readily removed from skin by washing with soap and water. Precautionary Statements : Dust generated in handling of this product can be explosive if sufficient quantities are mixed with air, in which case ignition sources should be avoided. Product may create a slip hazard when mixed with water. Spills should be dealt with immediately. Spills/Leaks : Spills of dry product present a slip hazard when wet and should be cleaned up immediately. Do not wet spills of dry product. Sweep up dry and flush spill area with water. Spills of dilute solutions may be absorbed with an inert material such as earth or speedi- dry and contained for disposal. While the information herein is believed to be reliable, no guarantee is made as to its accuracy of completeness. The conditions of use, handling, storage and disposal and the suitability of the product for particular uses are beyond our control consequently, all risks involving the use of the products are assumed by the user. We expressly disclaim all warranties of every kind and nature, expressed or implied, including the warranties of merchantability and fitness for a particular purpose.